IT TAKES a walkable neighbourhood—with shops, parks, schools and offices within close proximity and comfortable, green and safe pedestrian lanes—to get people walking. This is the finding of a long-term Australian study that shows that neighbourhoods play an important role in the health of residents—if so designed that walking is an easy option, people will walk more and stay fit. A team of researchers led by scientists from the University of Melbourne monitored the amount of walking by people in newly developed neighbourhoods in Perth. These areas had high pedestrian access to parks, public transport, shops and services and less transport-related destinations. The researchers collected physical activity data of 1,400 people before they moved to these neighbourhoods and about 12 months after they moved in. It was found that for every local shop, residents’ physical activity increased by five to six minutes of walking per week, while for every recreational facility available, such as a park or a beach, residents’ physical activity increased by 21 minutes a week. The study was published in Social Science and Medicine in January 2013. “If we continue to build places where there aren’t the opportunities for people to walk, it will have a major impact on people’s health status,” says lead researcher Billie Giles-Corti. This is not the first study that has firmly established a link between living environment and health. A study published in May last year in American Journal of Preventive Medicine showed that children from San Diego and Seattle in the US were 59 per cent less likely to be obese if they came from neighbourhoods that scored high on walkability and had parks and access to fresh fruits and vegetable shops within half a mile. Health and planning experts have, for long, been urging governments to make health a deciding factor in city planning. So how do Indian cities fare? “Most of the Indian cities are not planned at all and even the ones that are, do not emphasise on physical activity,” says B R Balachandran, urban planner and architect from Bengaluru. “There are some examples in Gujarat where local markets are created in Town Planning Schemes and DDA layouts, like Vasant Vihar, in Delhi, that have block level markets. However, even in such areas the conditions are unfavourable to walk. 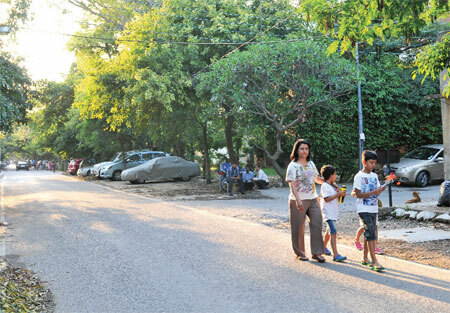 Even JNNURM has policies to promote walkability but there is not much action on ground yet,” he says.